Al Mohler has a very good summary of last night's evolution vs. creation debate between Bill Nye and Ken Ham. If you missed the debate, you can still watch it here. Thankfully, this debate was different from many debates between creationists and evolutionists in that it was polite, well ordered and well mannered, never descending into name calling and mud slinging. Both participants ought to be commended, as should the moderator and audience. The same cannot be said for those who have left comments on the various news sites that reported on the debate, or indeed of some of the reporters themselves, and especially many prominent and outspoken atheists who felt Nye shouldn't besmirch the white robes of modern secularist scientism by condescending to the level of debate with a young earth creationist, thereby lending such a one an air of legitimacy and respectability they do not deserve. In one very important sense, this debate was very similar to many past debates between creationists and atheistic or humanistic evolutionists in that only one side recognized and admitted that they have prior philosophical and faith commitments through which they judge all scientific evidence. Mohler and Ham recognized what was really at issue in the debate, which is the question, by what standard? By what authority do people believe what they do? Ham recognized and was not shy of the fact that, for Christians and indeed for him in the debate, the revelation of God in Scripture is the ultimate ground of authority for mankind. Bill Nye, on the other hand, while basing his arguments upon human reason, did not recognize that he had a prior philosophical commitment to human reason operating in a godless universe and that this presussposition affects and colours all the observable evidence that he looks at. Nye, along with other atheistic materialists, doesn't recognize that he makes just as big a prior commitment to autonomous human reason as Christians do to divine revelation. He doesn't recognize the fact that, no less than with Scripture for Christians, the presupposition that there is no God (or at least that if there is a God, he/she/it/they is irrelevant to nature and natural processes) is the lens through which the atheist views all things and sets the mental categories in which they process all the scientific facts they observe. This presupposition, this prior philosophical commitment, is every bit as much a faith commitment as the one a Christian makes. The secular humanist atheist cannot disprove the existence of God by their own standards of evidence with any more success than they demand observable proof of God's existence from creationists. It is an unprovable presupposition upon which all their understanding is based and through which all reality is viewed. It is taken on faith, and because of that, it is rarely recognized as such by those who claim to know all they do through the exercise of reason. If you make the firm assumption that there cannot be a God before you ever begin your scientific pursuits (or at least if there is a God, he has no role in the function of natural processes in the past or present), you will undoubtedly view all facts through the lens of your prior firm assumption. If you assume the existence of God as revealed in the Scriptures, you will process all data through that lens. In a very real sense, this was far more a religious debate than it was a "scientific" one. But only one of the debaters realized this. Something Ham was right to point out was that the modern scientific project owes its very genesis and ongoing existence to the Christian worldview. We can reproduce effects in a laboratory, we can reasonably expect to get the same result when we do the same action under the same conditions, we can predict future events based on our observation of past and present events. Nye enjoyed speaking about the predictability of nature and science. But while he (rightly) appreciates it, he has no way to account for it. All this predictability and repeatability is because the universe was created by a Creator who is the same yesterday, today and forever. In a universe designed and created by an intelligent Creator, we would expect order, laws, logic, reasonableness (something Nye liked also to repeatedly refer to). In a universe which came about through random and accidental processes, most of which Nye admits modern science can only guess at, we should not expect to see any of this. We should especially not expect to see such laws and order permeating every single thing to the most basic and foundational level and yet that is exactly what we find. I wish Ham had pushed his challenge to Nye to answer where information, genetic code, biological "programming" comes from in the absence of a Programmer. Only information begets information; only intelligence begets intelligence. Modern science has never yet observed it to be otherwise. I really wish Ham would have focused more of his efforts on this. This is the big gun of the Intelligent Design school and the thing that atheistic evolutionists have absolutely no way of answering. 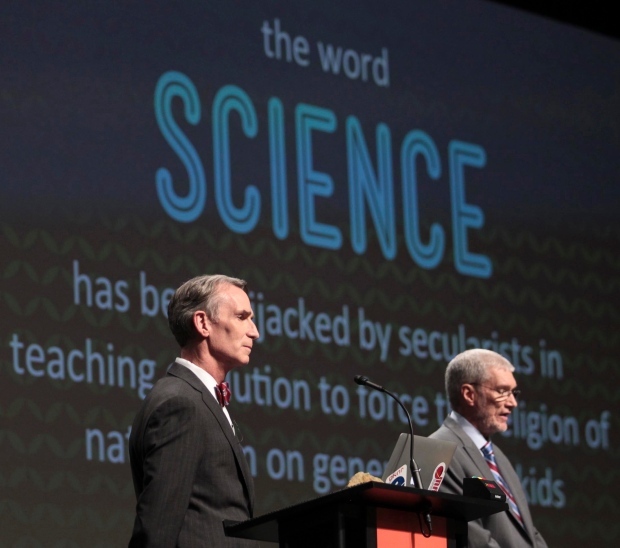 I think Mohler could have been a bit tougher on Bill Nye for his repeated straw man scenario. No creationist I am aware of dislikes or shuns technology because of their creationism, yet Nye kept harping on the need for kids to be taught science, to embrace science, to create and invent and to keep the US competitive in the global technology race. There is no creationist that would disagree with the principle of advancing technology (so long as biblical morality keeps up and governs it). But Nye, by repeatedly asserting this, implied that Ham and creationists are opposed to teaching children science, are against technological advance, and would like to see the US stagnate and fall behind the world in their scientific pursuits. PLEASE. That was really a pathetic and very low form of argument, one which Ham answered early on but which Nye insisted til the end to continue to bring up. The fact that Ken Ham was using an Apple computer in a climate controlled building while showing a power point with video clips refuted this silly form of argument, not to mention the examples of young earth scientists who have contributed far more significant inventions to the modern world than the tube in Boeing 747s that Bill Nye engineered. This debate was between two men who are firm in their worldviews which each of them holds by a faith commitment. One the one hand is worldview of secular humanistic atheism and on the other hand is the worldview of biblical Christianity. Both come to the task of science with prior philosophical commitments, with intellectual commitments they hold by faith. However, only one of them is aware of both his own commitment and that of his opponent. And only one of those worldviews allows for both God's divine revelation of himself and his work in creation as well as logical human reason. The other must of necessity reject divine intervention for the functioning of his system all the while embracing a human reason and logical order which his own system cannot even account for.